Tame street manners coupled with big power. At the heart of the Alpha 6 package is our tried-and-true tuning map. Through rigorous testing, we have developed a file for your car’s computer that extracts the most safe and reliable horsepower possible. In addition to the computer recalibration, we utilize HKS air filters to allow the turbos to breathe easier – allowing maximum efficiency of the factory intake system. Finally, we include a complete AMS spec exhaust system that adds even more horsepower along with a throaty tone to convey the appropriate bark to your GT-R’s bite! The key to the success of the Alpha 6 is freeing up exhaust flow with a properly tuned downpipe design. 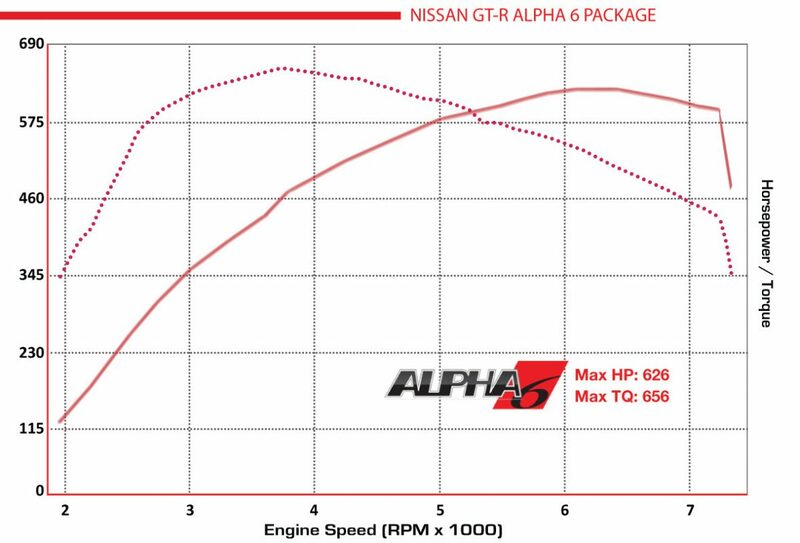 In addition, we improve the cam timing characteristics while increasing turbo output. In doing so, we are able to make impressive power gains of 120HP! You will certainly notice improved response due to quicker turbo spool; the system yielding a significantly wider power band than stock.